Somehow, Community survived its topsy-turvy first five seasons and Season 6 will soon find its way to the show’s rabid fanbase via Yahoo! Screen as one of the latest in a line of series that jumped from networks to online streaming services. A new clip has emerged, bringing viewers old and new back to Greendale for, you guessed it, one of the quirkiest disasters known to man: the Frisbee avalanche. Check it out below. In true Community style, this clip works both as a legitimate season-opening introduction and as a self-aware welcome to its fans. The reference-filled comedy is arguably as different now than it has ever been – with longtime cast member Yvette Nicole Brown and Season 5 newcomer Jonathan Banks dropping out – and new cast members like Paget Brewster and Keith David joining in on the eccentric fun. But as soon as the Dean starts talking on the intercom, it feels like exactly the same show, which is no small feat, given everything it has gone through. So what are our old Greendale buddies up to? Well, Jeff is still teaching and still doing things he isn’t supposed to, such as parking in an Electric Vehicle Parking Only spot, despite driving a non-electric car. If that’s not sticking it to the system…well, I doubt there are a lot of people at Greendale who would be using that parking space anyway, and Jeff probably has a perfectly long and touching explanation about how he’s actually helping people by doing this. Someone who would probably love to have a car to live in is Britta, who apparently doesn’t have anywhere to call home anymore. And of course she’s using her misery as a way to spread the word about homelessness, because Britta always makes a statement. We learn a little less about Abed, who is just seen meta-mouthing the words that Dean is saying, and Annie. 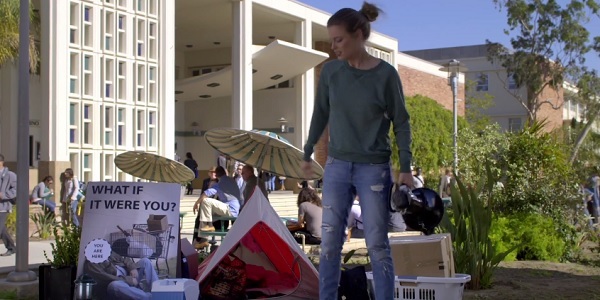 Although we do find out that Annie is, while not responsible for putting all of those Frisbees up on Greendale’s roof, possibly the one who should have taken them all down, as to avoid certain disaster. Of course, considering how all it took was one more Frisbee to make it all topple, I’m not sure that Annie would have survived going up to the roof to clean it. We can’t lose any more characters! Head here if you haven’t seen the full Season 6 trailer yet, and keep your eyes and disc-throwing hands ready for Community’s Yahoo! Screen debut on Tuesday, March 17.